Paul Manafort, accustomed to $10,000. House of Bijan suits, appeared instead for yesterday’s pre-trial hearing wearing an Alexandria jail issued prisoner jumpsuit. 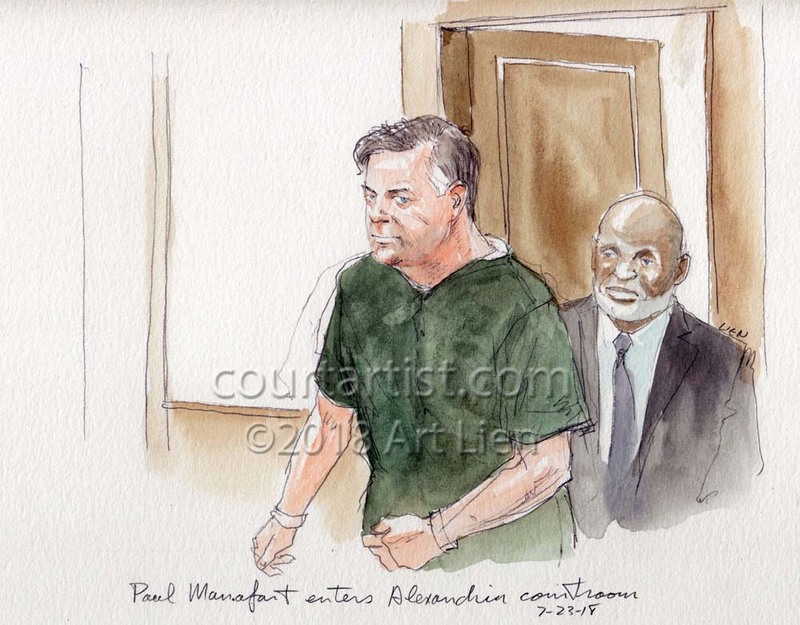 Looking disheveled, the collar of his green jumpsuit turned inside out, the usually dapper Manafort did not look comfortable. Perhaps that is why he has declined to be present in court today as prospective jurors are summoned to fill out questionnaires. Judge Ellis granted the defense’s request to delay the start of the trial so that they could have more time to review evidence, but only for a week. The trial is now scheduled to begin next Tuesday, July 31. Thank you. I just posted this week’s sketches. When I saw the first illustration of Manefort I was so excited. Your illustrations are beautiful. I look forward to following you throughout the trial. Thank you, Jill. I just posted this week’s sketches. Every day I see your work and I’m so impressed. 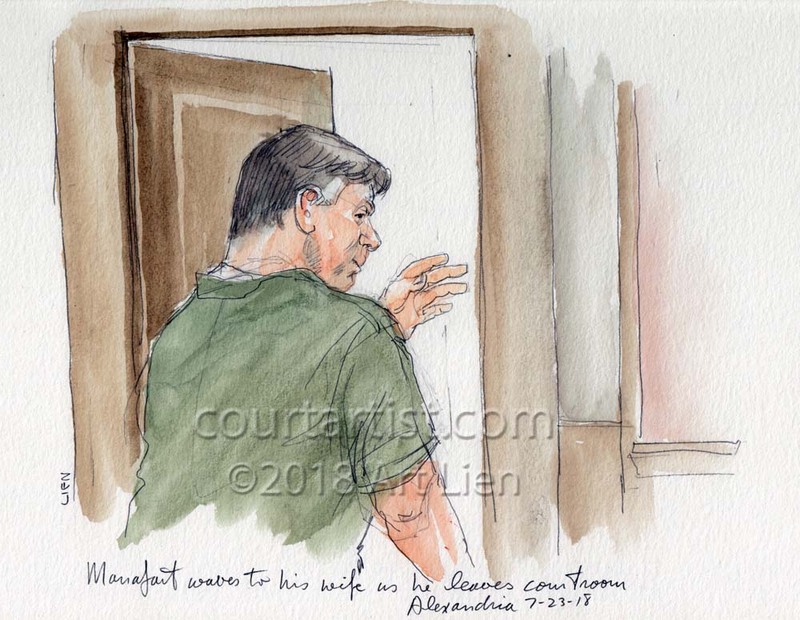 I would love to hear what drew you to be a court sketch artist, and if you have any advice for someone looking to get into the field? I am an artist, and am considering looking into it, but have no idea where to begin. Thanks for any tips! I don’t want to discourage you, Dawn, but courtroom sketching is a dying art. Not much work out there and it won’t be long before cameras are everywhere. 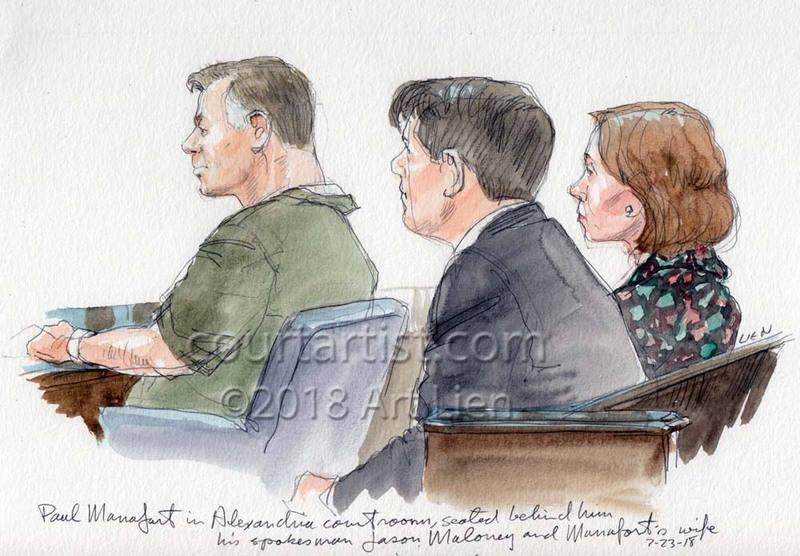 Nevertheless, you can go to pretty much any courthouse and sketch the proceedings. Then if the opportunity presents itself you’ll be ready and experienced. I got my start when our Maryland governor when on trial and a local TV station was looking for an artist. Great work. Why do you sketch Manafort’s eye color as blue? His eyes are brown. Wow. Your sketches are amazing. They’re more than sketches, as you know. My Mother was a fine artist, educated at the Phila. Academy of Fine Arts. When I was a kid she did a couple of trials, and i was always amazed how quickly and how, with such intense concentration, she had to ‘catch’ the moments, complete with expressions, responses, and color. These are the best I’ve ever seen. I look forward to the day’s proceedings just to see your drawings. Thanks so much. Your choices in detail and color are amazing. Do you draw other things besides courtroom. Thanks, Muriel. I don’t do a lot outside of the courtroom. Just too exhausted, I guess. Am eager to start on some watercolor landscapes once things quiet down (if that time ever comes). Oh I absolutely love your work. 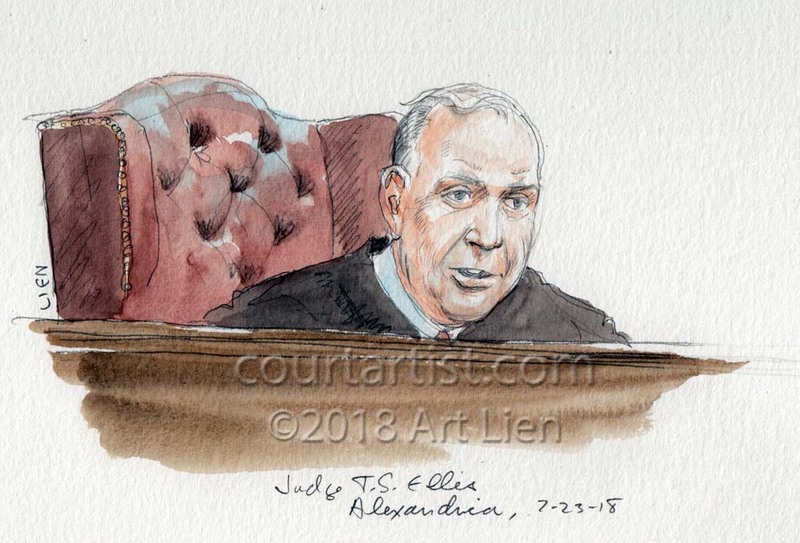 I never thought much about the person behind the art, court sketches in particular, until I came across a link on Quora (one of my favorite places to browse the news) that linked to a very nice story about YOU, Mr. Lien. 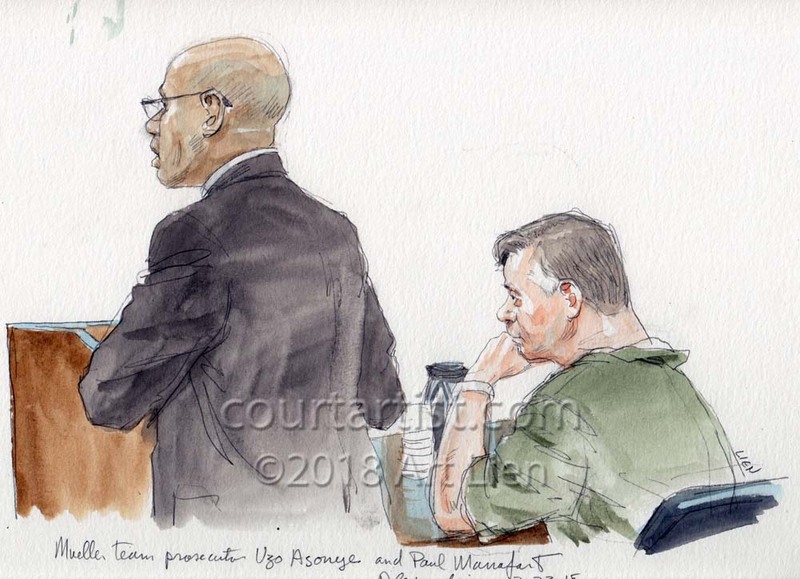 The analysis of your art is excellent, intriguing, and opens my eyes to something I took for granted – having never realized what is really going on behind a court sketch. I think you will appreciate this article, so I felt compelled to share the link with you. 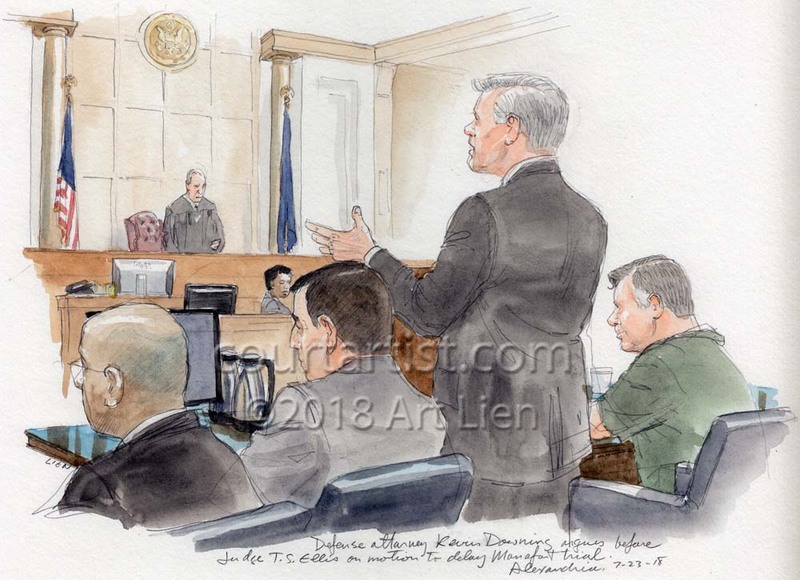 You should do a few-page write-up of how you approach your work, things that you look for, what you are thinking as you do this work, and more importantly – how in the world you are able to take a mental snapshot of something and capture, with such keen detail, the setting in a courtroom. Are you simply that quick that you don’t need to hold the snap shot in your mind for long? How do you do this!? Curious minds want to know! Of course this is only my suggestion, I think it would be very cool to know more. Maybe write yourself a book about your experience (1976?! 40+ years at this work?!). If you ever take my suggestion, please figure out how to send a copy my way. I’d love to read it. Thanks for the suggestions, Brendan. I don’t know about writing a book though a lot of people suggest I do, but your idea of a few-page write up sounds good.